Ok, sure, we all need to work on basic turns, balance and throttle controls, blah, blah, blah. 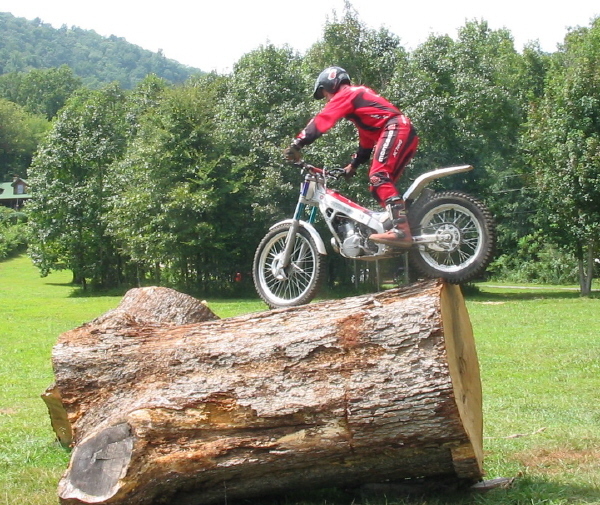 But we all know that every rider (especially young rider) wants to GO BIG, everybody wants to splatter that big rock ledge and impress their friends with their high flying skills and daring. Where were the biggest crowds at the Duluth World Round? At the big splatter wall, of course! So with some tips and demonstrations of the Pros from the Trials Training Center, now’s your chance to be a real throttle jockey. And even if you only do this in your dreams, read on and you be able to watch the pros with a keen eye and see how they get up such amazing obstacles. 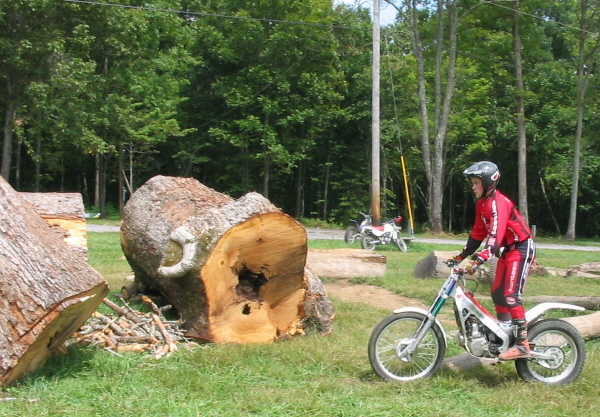 The splatter is a technique, most often used for big ledges, in which a rider uses the suspension, throttle, and a lot of legs to launch the bike at a ledge such that the bike rotates backward in the air and impacts the face of the ledge with a rear wheel first landing. 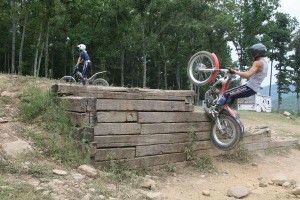 Much like the backflip that the freestyle guys do, the bike rotates backward after takeoff and until the rear tire contacts the ledge. Without the impact into the face of the ledge, the rider would land on his back; in fact, this can happen if the rider gets so much lift on takeoff that the ledge is overjumped! have a slippery approach with poor traction; the splatter may be less risky under such circumstances. But not so fast, there’s more involved here than just a hammer fist on the gas and lots of testosterone. According to TTC instructors Bruce LeRiche & Brent LeRiche, the splatter is all about timing. 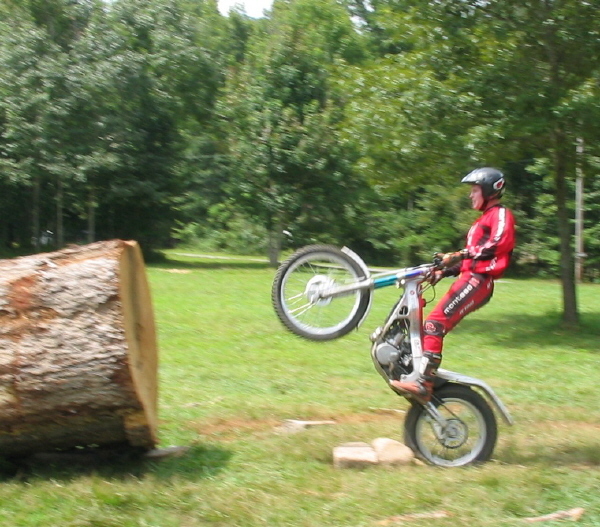 The riders who get the big lift and conquer the biggest steps are the ones with the most precision on timing. 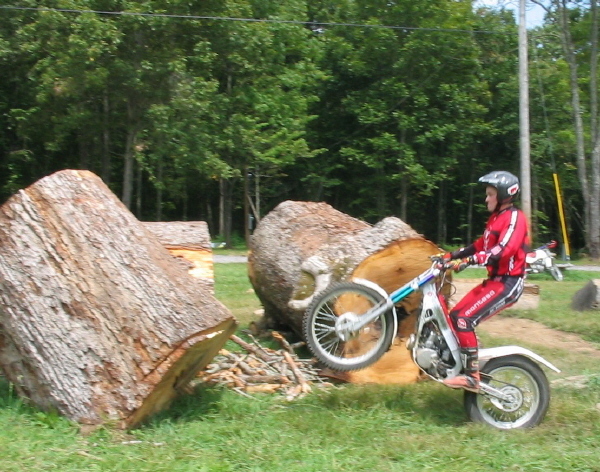 Look for a kicker such as a rock or solid bump to help compress the suspension. If you are a world round factory rider, have your minder provide one if necessary. In general, the ideal kicke r should be about the same distance away from the ledge as the height. A closer kicker requires less speed and more lift from the rider, a kicker which is farther away requires more approach speed. Always use at least 2nd gear, and 3rd gear for bigger steps. 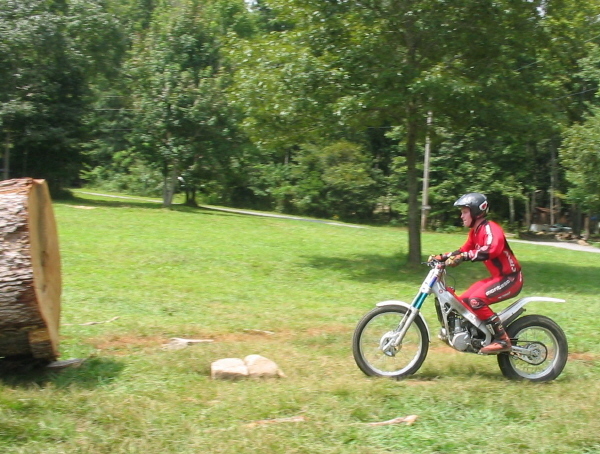 On the approach, rev the bike to peak revs while slipping the clutch. Revving the bike to the moon also gets the flywheel spinning up fast for later when you will be dumping the clutch and you need instant response. Feed the clutch out to get the bike to the proper approach speed, slipping the clutch according to the available traction to keep the revs up and avoid wheel spin. Wheel spin is a no-no, the rear needs to stay hooked up. 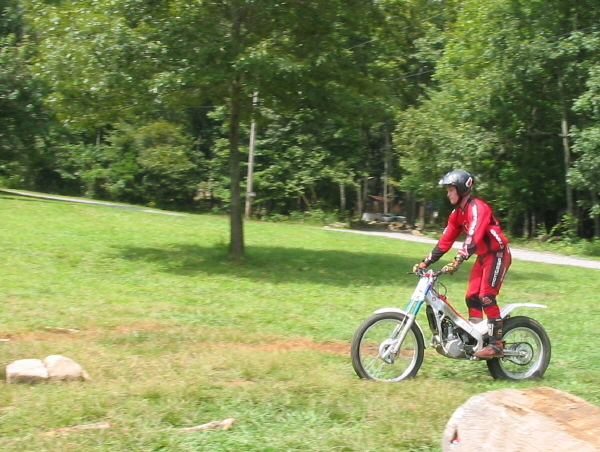 Just before the kicker or takeoff point, kick down on the bike, compressing both the front and rear suspension as much as possible. 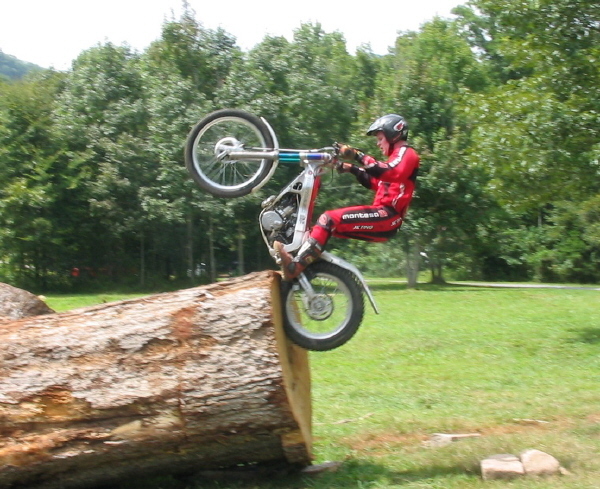 If you watch the pros at the nationals or world rounds, you will see some of the top riders approach with a double jump, using the first bounce to get the bike moving up and down so that the 2nd bounce before takeoff is even bigger. This technique requires very precise timing and is much more difficult than it looks. 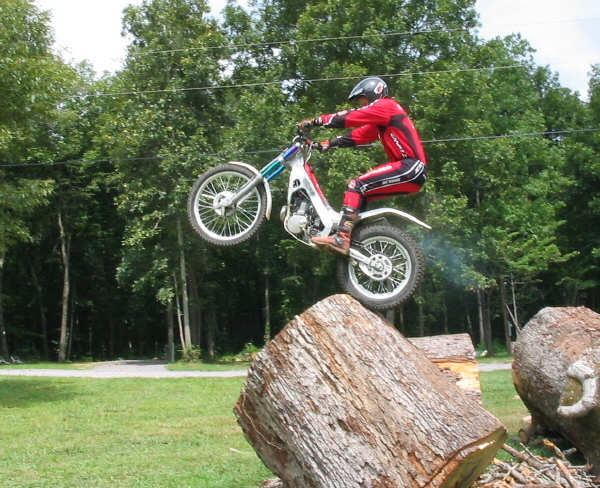 As the front wheel approaches the kicker the suspension should be fully compressed and when the front wheel hits the kicker the rider should be simultaneously springing out of the crouched position and dropping the clutch. 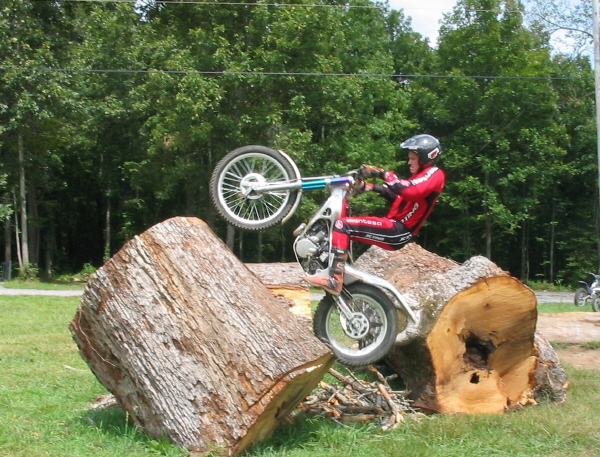 As the back wheel hits into the kicker (or ground if there is not one), use lots of legs to launch the bike toward the ledge. Use your body to do the work, the kicker is there only to help. Pull up HARD on the bars and kick hard with the legs. Handlebars should come to the chest, and back wheel is extended during flight. As the back wheel impacts the ledge, absorb with the legs and extend arms to leverage the bike up & over. Smile for your adoring fans. If the rock has grip (like Colorado), you can hit a bit lower and drive up the face a short distance because there will be tremendous load on the rear tire. If the rock is very slippery or badly undercut (like Tennessee), you will need more momentum and the kicker is ideally a little farther away. The best way to practice is to use the technique on a smaller safe ledge that probably would be easily climbed using a different technique. (Left photo, click to enlarge. That’s the splatter practice wall at the TTC. 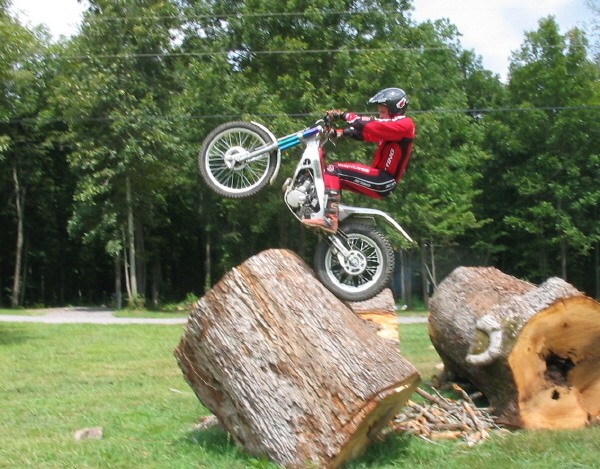 Photo courtesy of Brian Roper, from his motorcycle trials gallery.) Experiment with kickers at different distances and work on the timing of the launch. A sloping dirt bank is a good place to practice, so if you badly miss-time the launch you don’t ram front wheel first into an undercut rock. Also, if you overjump into a bank that slopes up, you will be less likely to land on your back. One last practice tip, always ride with a buddy and get a spotter on the ledge to catch your bike if you come up short. So with these tips and a lot of practice, you can be flying high!